Micky Dolenz, Mike Nesmith, Peter Tork, and Davy Jones. If you are of a certain age you know exactly who those four men are. If not and you're curious, welcome to my little tribute to The Monkees. Originally brought together to make a TV show in 1966 featuring a band in a Beatles-esque fashion, producer Don Kirshner (anyone remember the late night 70's TV show Don Kirshner's Rock Concert?) was brought in secure music for the show. The four were hired as actors, but all had previous music experience. Kirshner set out to assemble them into a band. Mike Nesmith was a guitarist and Peter Tork played several stringed and keyboard instruments. Davy Jones was a novice drummer, but the camera could barely capture him behind the drums because of his short stature. Micky Dolenz, who was a guitarist, was assigned to become the drummer. Not the usual way of bringing musicians together to form a band. For the early episodes of the television show the group only contributed vocals to the tv performances, while other musicians provided the instrumental tracks. There simply was no time for them to rehearse together since filming was 12-14 hours a day, vocal recordings were done in the studio after filming, and public appearances ate up the rest of the week. The original pilot intro was sung by Boyce and Hart, popular songwriters of the era. The Monkees first single Last Train to Clarksville was released prior to the first episode airing to generate a buzz about the show and within a month their debut album hit the shelves and skyrocketed to the number one position. Much to their chagrin, The Monkees were not allowed to write any of the music or even play any instruments on their album. In fact, they were completely left out of the process until called in to lay down vocals to the already completed tracks. Soon the success of the tv series and subsequent album release mounted a push for The Monkees to go out on tour and rehearsals as a band began in earnest. Their 1967 tour with then unknown opening act The Jimi Hendrix Experience, was greeted by throngs of frenzied fans. They were backed by a band called The Sundowners out on tour. Concerts sold out, fans increased, and unbeknownst to the group a second album, More of The Monkees, was released with absolutely no input from the band. In order to hear the album the group had to go out and buy their own copy since they had not even been given one by Kirshner.This was added fuel to the fire of their dislike of Kirshner. He was eventually fired after a disput in February 1967 with Colgems Records. 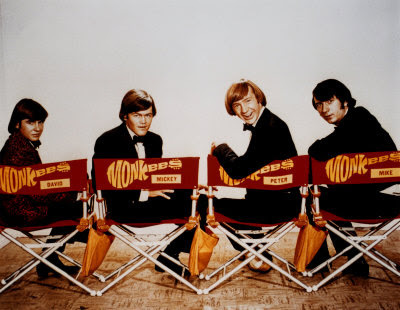 With Kirshner out of the picture The Monkees hit the studio with a vengance to record an album of their own songs, playing the instruments themselves along with a few guest musicians. By this time their playing had improved on their respective instruments and they were wanting to prove they were not just actors in a tv show. The result was their next album Headquarters. It was well-received and shot to number one, but had the misfortune of being pitted against a little album known as Sgt. Pepper's Lonely Hearts Club Band the following week. Dissention amongst the group began when musically they wanted to go in different directions. The next three albums were all over the place stylistically and Mickey, not comfortable in his role as a drummer no longer wanted to play on albums. Many feel the band was unfairly persecuted about using session musicians when other groups such as The Beach Boys and The Byrds were doing the same thing with no repercusions. Pleasant Valley Sunday- Written by Gerry Goffin & Carole King, the song reached number 3 on Billboard charts in 1967. Remember The Monkeemobile? Here it is in a car show. I'm a Believer- Composed by Neil Diamond this 1967 hit went gold in two days and was the biggest selling record of the year. In 1968 The Monkees starred in a film entitled Head co-written in part by Jack Nicholson. It's a wild psychedelic romp that is esentially without a plot but with references to social topics of the time- namely Vietnam and drugs- and starring an eclectic group of performers: Frank Zappa, Sonny Liston, Carol Doda, Toni Basil, Annette Funicello, and Terri Garr to mention a few. This rambling interview about the film matches the film's wildly scattered direction. I do love the song from the film called The Porpoise Song written by Gerry Goffin & Carole King. While not a commercial success the film has become somewhat of a cult classic. The song was also used in the 2001 Tom Cruise film Vanilla Sky. Tensions increased and in 1969 Peter Tork left, the following year Mike Nesmith departed, leaving Davy & Micky to join up with Boyce & Hart as a touring band. Goin' Down- I like this solo of Mickey's. Over the years reunions have occurred and Davy, Peter, and Micky have toured together. Mike has not been interested in touring keeping busy with his video production company. Many also know that Mike's mother was the inventor of Liquid Paper and left him $25 million upon her death in 1980 allowing him the freedom to only work on projects he is truly passionate about. 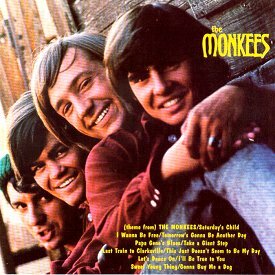 I saw The Monkees at the Fillmore, San Francisco in 2001 and it was a fun-filled sing along with Davy, Micky, & Peter. At the end of the night, a very tall man standing next to me at the foot of the stage had the good fortune of being handed an electric hollow-body guitar by Davy Jones that he had played at the end of the set. I was just a kid when The Monkees stormed onto my television screen, Teen Beat magazines, and across the radio dial. But their music still stirs up an emotional response for me. Although their career as a foursome was rather short-lived, it has left an indelible impression on me. Davy Jones & Michael Nesmith share a birthday on December 30th. Davy will be 65 and Michael will be 68. Happy birthday and thanks for the tunes! If you feel like browsing more from The Monkees take a look here on my Cooliris Wall. I tried to filter to all Monkees videos but there some rogue ones that snuck in.